The curtain is drawn upon the lives of Abraham, Isaac, and Jacob before the realization of the promise. Despite the glory and grandeur of their lives, they each go down into darkness without having seen the flourishing and fulfillment God’s covenant with them. Amid signs, wonders, restoration and reunion, each of their lives is touched by futility. Indeed futility appears to be the final word and seal upon their lives, the lives of us all. After all of our work, our hopes, fears, and dreams, the striving and occasional triumph, we and the heirs of our goings and comings upon the earth, must each enter into death, the final act of this life–the curtain call to all it all. The Cave of Machpelah, the Patriarchal burial place in Genesis, certainly affirms the reality of death. 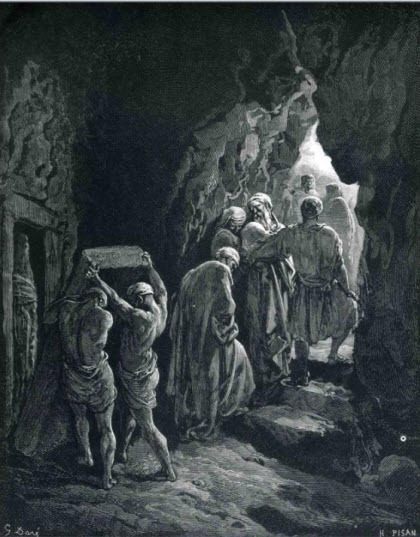 Abraham purchases this cave as a familial burial site, acknowledging the universal impermanence of this mortal life. The mouth of a cave opens into darkness and into the dust out of which we are formed and like a primordial terror swallows one’s bodily remains back into itself. Yet, the very impulse to purchase a burial place, a common place of some permanence, seems to simultaneously question the meaning of death. Even as Machpelah exists as a sign of human futility; it simultaneously stands as a reminder of our unity. The human race is one, in as much as we each must walk through the jaws of death. Even more remarkably, Abraham’s instinct is to enshrine this unity. Sarah is not buried under some unnamed stone; nor is she left anonymously in the desert, or floated out to the Jordan. Thus the cave possess a double meaning. Even as it acknowledges human futility, impotence, and mortality; it simultaneously acknowledges our familial unity, a unity of love which transcends bodily death–a desire to be sown together even after falling unto and into the earth. When we read of the burial of Jacob, who is brought out of Egypt and into the tomb of his forefathers, when we read of the promise which Joseph exacts to bring his bones out of Egypt, what we may hear are the shadows of a promise yet to be fulfilled. Abraham, Jacob, and Joseph go to be “gathered unto [their] people.” Yet, they go in unspoken hope. The double meaning of death and of this piety is recognized in the very naming of the burial site: Machpelah, which means ‘double-portion’. The name can be attributed to a cave with multiple levels, but is not all life, all speech, and deed a thing which exists on multiple levels, expressing layers of meaning and desire? Read allegorically, or as an expression of the ultimate intent of Abrahamic piety, what can this second or double portion refer to? We need to read the Cave of Machpelah through another story. A story which is the fulfillment of the Abrahamic covenant–a story, by the way, which caves also figure in to. God comes to us in the flesh, as a child, not to set aside the futility of death (which is the futility of human life), but to enter into it and sanctify it, thus removing its sting, and its ultimate victory. Born in a cave, his very beginning is marked by a participation in mortal poverty, brought forth among the dung ,and stink, and semi-darkness of the world, just at the boundaries of civilization. In living, he submitted himself to the abuse and misunderstanding of his fellows. He allowed his words to fall on deaf ears. And in the culmination of his ministry, he is nailed to a cross, and allows himself to be crushed by death–fully submitting himself to a mortal futility and the seeming finality of life. His corpse is taken down from the cross and is again returned to the outskirts of civilization. It is returned to the darkness and obscurity of a cave, and this time there is a great stone rolled over the mouth of this cave. Thus the son of God allows himself to be swallowed into the darkness–entering into our final futility and isolation. But as noted in the Abraham story, in so doing, he also enters fully into solidarity with the human race. He enters into all the unfulfilled hopes of Abraham, Isaac and Jacob–of all those who have gone down or will go down into darkness. So death is no longer the curtain of the final act, but through faith, an intermission in which we await a ‘double portion.’ Those who sow in tears, as did Abraham with Sarah, as did Joseph with Jacob, as did our Master, might reap in Joy His promised reward. The Cave of Machpelah is a sign of the Abrahamic faith, the shadow of an unspoken hope in which the people of God lived and died. An anticipation of God’s faithfulness.